PERPETUAL MOTION MACHINE is a device that can continuously produce work with no energy input, or that can continuously convert heat completely into work. No one has ever succeeded in building a perpetual motion machine and almost all scientists and engineers believe no one ever will. But experiments made in the hope of achieving perpetual motion have led scientists to develop two laws of thermodynamics. These laws summarize how all machines work. The first law says that energy cannot be created or destroyed. The second law says that heat, by itself, can flow only from a hot object to a colder object. 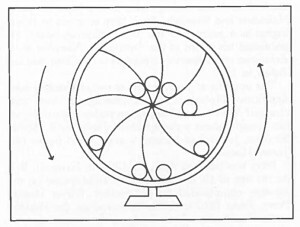 Two kinds of perpetual motion machines have been suggested: (I) machines that would run forever without receiving energy from the outside, and (2) machines that would run forever and produce work by taking energy from the sea or from the atmosphere. 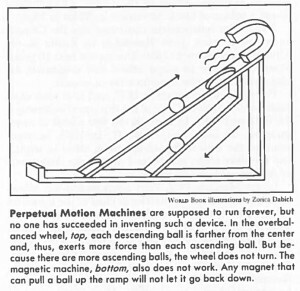 The first kind of perpetual motion machine could be made to run if it were possible to avoid resistance. However, the moving parts of all machines are subject to friction or sonic other kind of resistance, which slows down the machine. To keep running, the machine must use energy to overcome this resistance. Without energy input, all machines eventually stop. Therefore, scientists have concluded that no machine can create energy. The second kind of perpetual motion machine could be made to run continuously if it were possible to use up all the energy in a large source such as the sea or the atmosphere. This kind of machine would run only if all the energy of the randomly moving molecules in the source could be completely converted into useful work. No machine has been able to do this. As a result, scientists have concluded that no machine can convert all the heat supplied to it into work. The second law of thermodynamics is based on this conclusion. The launching of space rockets and artificial satellites has given some persons the idea of obtaining perpetual motion with these devices. This is because the planets and their moons appear to have achieved perpetual motion. But they move in an almost perfect vacuum. The artificial satellites that orbit relatively close to the earth all have limited lifetimes because of atmospheric friction. The farther a satellite orbits from the earth, the longer its life expectancy. But scientists expect that even satellites that go into orbit around the sun may eventually hit the sun, perhaps in millions of years. The release of nuclear energy has also been considered a possible source of perpetual motion, Uranium and other atomic fuels do contain tremendous amounts of energy for their size. But after this energy is used up, the remaining matter must be replaced with fresh fuel. Devices that use atomic fuel cannot run forever. For example, atomic submarines must be refueled periodically.